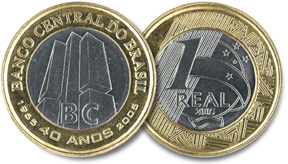 Banco Central do Brasil released on September 23rd, 2005, R$ 1,00 circulating coins to mark the 40th anniversary of the Institution, with limited edition of 40 million coins. On the front side, central image inspired in the official logo created by the Institutional Relations Secretariat team of the Banco Central do Brasil for the commemorations of the 40 Years of the Institution, that utilizes the straight reference of the perspective of the Building-Headquarters in Brasilia and the legend “BC”, beyond the inscriptions “BANCO CENTRAL DO BRASIL” and “1965 40 ANOS 2005”. The back side design was not modified.